Expedia has Gera travel packages ready and waiting for you. Bundling your lodgings and airfares is one of the easiest ways to save money on your adventure. Smart travelers who grab a package deal on Expedia will save as much as C$590*. Our impressive global database offers more than 321,000 properties worldwide and 400 partner airlines. With such a broad range of options, planning your dream vacation will be simple! Itinerary looking a little empty? Gera vacation all booked but no idea what to do when you get there? Let us assist. Great theater challenges our way of thinking and asks us to aspire to more. Get tickets to a show at Theater Gera and expand your way of thinking. Visitors are spoilt for choice in and around this destination. Otto-Dix-House hosts a range of events and performances throughout the year. Peruse the events calendar for your next activity. Still have time on your hands? The intimacy and mastery of theater is hard to deny. Book your ticket for a production at Theatre Altenburg Gera and experience its charm for yourself! There are only 5 Expedia accommodations in Gera. Book now to guarantee you get a place for your next cheap vacation or luxury getaway. Start your vacation on a fancy note by slipping between the soft sheets at the Novotel Gera (Berliner Str. 38). Alternatively, the Apart Hotel Gera (Hofer Strasse 12d) is an excellent place for the money-conscious traveler to spend their evenings. Leipzig - Halle Airport (LEJ) is the gateway for most travelers heading off on a trip to Gera. It's based 35 miles (56 km) from the heart of town. Situated in Gera, this hotel is within 20 mi (32 km) of Blankenhain Castle, Bismarck-Hain, and West Saxon Textile Museum. Inselzoo Altenburg and Grosser Teich are also within 20 mi (32 km). Gera (ZGA-Gera Train Station) is 8 minutes by foot and Gera Central Station is 8 minutes. Located on the riverwalk, this family-friendly hotel is within 20 mi (32 km) of Blankenhain Castle, Bismarck-Hain, and West Saxon Textile Museum. Badewelt Waikiki Water Park and Inselzoo Altenburg are also within 25 mi (40 km). Gera Central Station is 11 minutes by foot and Gera (ZGA-Gera Train Station) is 13 minutes. Located in Dürrenebersdorf, this hotel is within 25 mi (40 km) of Blankenhain Castle, Badewelt Waikiki Water Park, and Marien Church. Werdau City Hall and Bismarck-Hain are also within 25 mi (40 km). Located in the heart of Gera, this hotel is within 20 mi (32 km) of Blankenhain Castle, Badewelt Waikiki Water Park, and Bismarck-Hain. 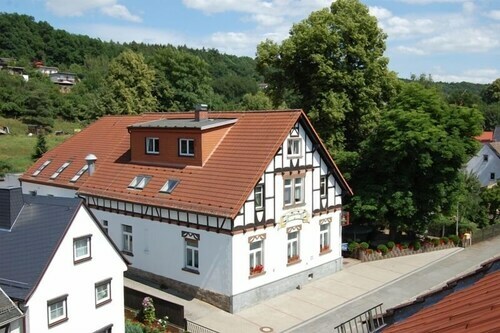 West Saxon Textile Museum and Inselzoo Altenburg are also within 25 mi (40 km). Gera Süd Station is 6 minutes by foot and Gera Central Station is 16 minutes. Situated in Gera, this hotel is within 25 mi (40 km) of Badewelt Waikiki Water Park, Stadtkirche St. Michael , and Blankenhain Castle. Bismarck-Hain and West Saxon Textile Museum are also within 25 mi (40 km). Töppeln Station is 23 minutes by foot. 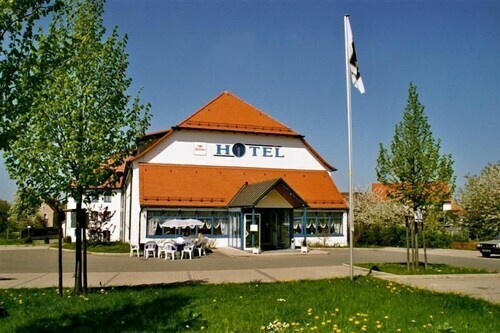 Situated in Gera, this hotel is within 20 mi (32 km) of Blankenhain Castle, Badewelt Waikiki Water Park, and Bismarck-Hain. 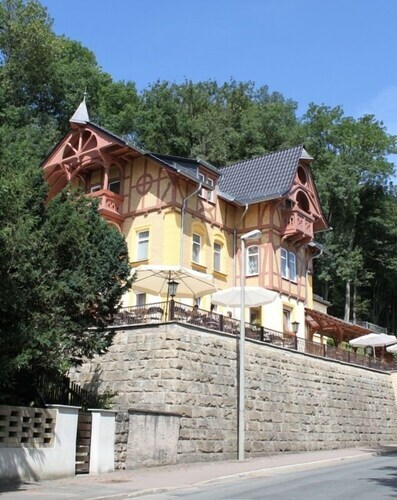 West Saxon Textile Museum and Inselzoo Altenburg are also within 25 mi (40 km). Gera Süd Station is only a 5-minute walk and Gera Central Station is 18 minutes. Situated in Gera, this hotel is within 20 mi (32 km) of Blankenhain Castle, Bismarck-Hain, and West Saxon Textile Museum. Badewelt Waikiki Water Park and Meerane Hohler Caves are also within 25 mi (40 km). 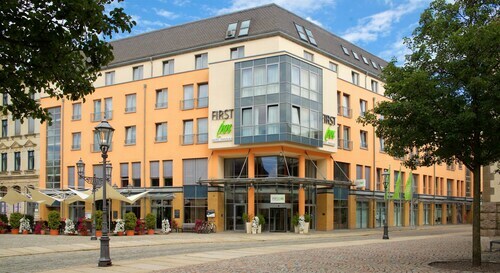 Located in the heart of Zwickau, this hotel is steps from West Saxony University of Applied Sciences, Robert Schumann House, and Priest's House. St. Marien Cathedral and Theater Plauen-Zwickau are also within 5 minutes. Zwickau Zentrum Tram Stop is only a 3-minute walk and Zwickau Stadthalle Station is 20 minutes.